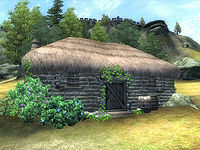 Shetcombe Farm is a farm northeast of Kvatch (quest-related). It consists of a single farmhouse, two crop fields, and a livestock pen. The farm belongs to Slythe Seringi, and the quest that starts here involves tracking him down. 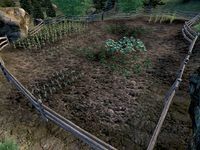 The two crop fields here with several ingredients make it an excellent place for budding alchemists to collect large quantities of ingredients to make potions. Northeast of the farm is a giant nirnroot plant. The interior of the farmhouse is pretty normal, consisting of a bed, a chest of drawers, a couple of tables and chairs, and assorted crates and barrels. 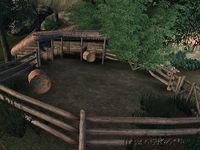 Entering the house is not considered trespassing, so the bed is free to sleep in, though thoughts of using it as a home should be tempered by the nearby bandit camp and monsters, as well as the fact that all of the containers respawn. Esta página foi modificada pela última vez à(s) 19h38min de 8 de setembro de 2014.